Right from the outset the Toyota Aygo has made a name for itself as the ideal urban runabout, mixing cheeky styling and small dimensions with low running costs and engaging handling. What nobody could have anticipated, however, was that the model would also became something of a magnet for crazy antics. 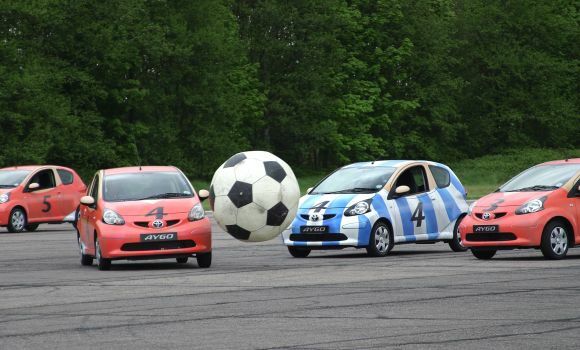 To mark its launch, Toyota teamed up with BBC motoring show Top Gear for the first ‘car football’ match. 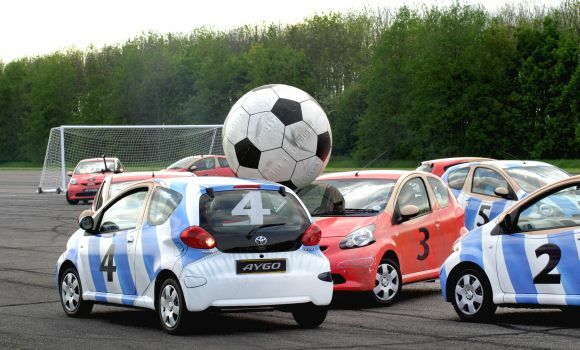 Ten brand new Aygo models were kitted-out in team strips for a competitive five-a-side battle that clearly showcased the car’s manoeuvrability and pace, not to mention its robust qualities. Commenting further about his unabashed love for the model, Collins said: “We had about five or six touring car drivers on that day and we unanimously agreed we hadn’t had that much fun in a car that we could remember.” During the interview Collins went on to name the Aygo as his favourite car of all time, though it was also one of the cheapest he’d driven. A surprise admission, perhaps, but from numerous JD Power customer satisfaction results we already knew that Aygo owners were among the most satisfied drivers on the road. The model has been a perennial winner in the City Car class despite increasingly tough competition. In its launch year the Aygo also received Top Gear’s Car of the Year title, albeit shared with the Bugatti Veyron, a car 120 times more expensive to buy. 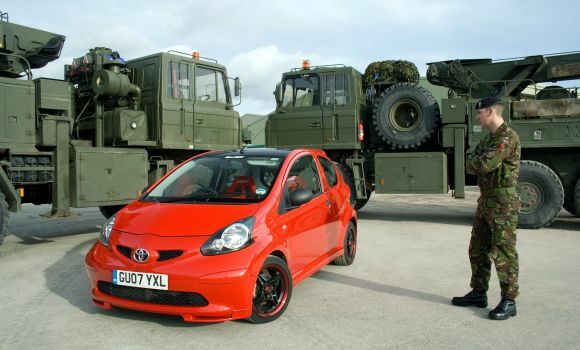 Showing just how tough Toyota’s entry-level model is, battle-scarred players from the opening round of car football returned fighting for a Top Gear World Cup Final against a fresh team populated by the then-new Volkswagen Fox. Meanwhile, one of the Aygo substitutes was diverted to rival programme Fifth Gear for an incredible loop-the-loop challenge, which recreated the classic Hot Wheels set with a 40-foot loop that took car and driver through forces of up to 6G. The challenge was successful, setting a new loop-the-loop world record in the process. Back on terra firma, Aygo consolidated its status as one of the most fuel-efficient cars on the market with wins in various economy driving, or hypermiling, marathons. Regularly achieving over 80mpg — frequently the highest overall figure for a petrol engine — these events proved that it’s not only what you drive that can make a big difference to your motoring expenditure. Watching how you drive can help you reap double the benefits. Though never designed to be a sports car, Aygo has demonstrated itself to be remarkably adept in competition. 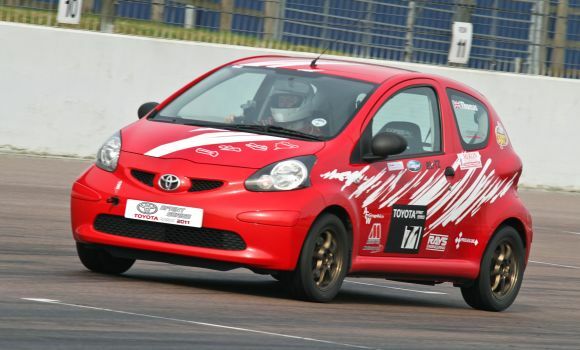 Toyota’s sponsorship of grassroots motorsport, such as the annual Toyota Sprint Series, saw the lightweight Aygo consistently achieve the top spot in its class, while regularly posting faster sprint times than much more powerful machinery in higher classes. The model’s relative lack of power was something addressed by then editor of top-selling Japanese car magazine Banzai in a unique project published in a series of build diaries. His idea was to further reduce the kerb weight while extracting as much reliable power as possible from the internally standard engine; essentially turning a city car into a road-legal track car. With a supercharger conversion specifically designed for the project, engine output was boosted from 67bhp to an incredible 138bhp, corroborated visually with fixed bucket seats, a Toyota Motorsport body kit, lightweight alloy wheels and uprated suspension and brakes. The project was then given away in a high-profile competition, won by an army engineer based at Tidworth Garrison, Hampshire. But if the Banzai project offered a glimpse of Aygo’s potential, it was Toyota GB’s own undertaking with the appropriately titled Aygo Crazy that cemented the fact that it is truly possible to go bananas with this model. Designed as an antidote to all those wild concept cars that look fantastic on show stands but never turn a wheel in anger, this one-off ‘shopping supercar’ concept was like an Aygo pumped up on steroids. Gone was the original front-mounted engine and running gear, being replaced with a mid-mounted and turbocharged 1.8-litre Celica/MR2 engine driving the rear wheels. Power was now in the region of 200bhp, which was only just about reigned in through the vehicle’s widened track and responsive, four-square stance. 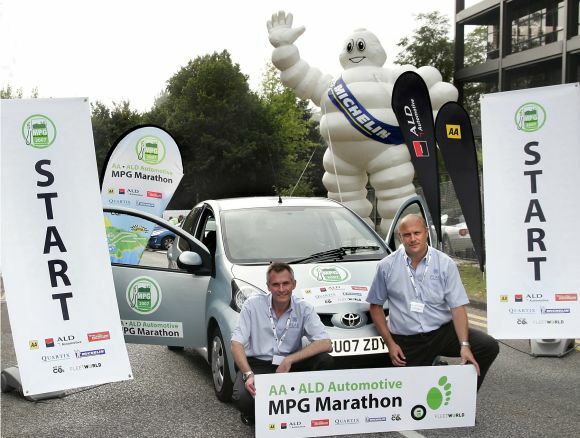 A worldwide phenomenon, Aygo Crazy has not only had starring roles in the London Motor Show and Goodwood Festival of Speed but has also been packaged off to charm enthusiasts overseas, notably a hillclimb event in South Africa. 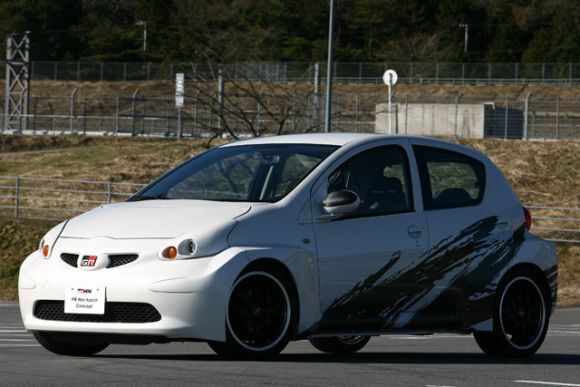 Echoes of it could also be seen in the Aygo-based GRMN Hot Hatch Concept first aired in Japan in 2010. 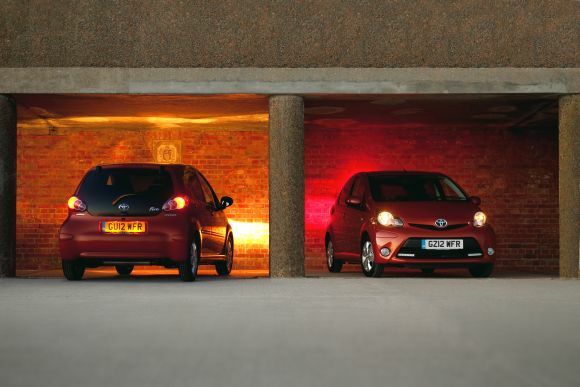 Currently the Aygo Crazy is retained for posterity within Toyota’s heritage fleet. 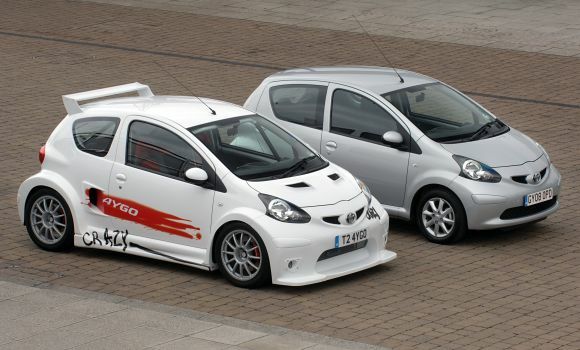 Has all this Aygo craziness inspired you to go a bit ‘bananas’ with your own car? Or has it simply intrigued you to discover what all the fuss is about, making you want to get behind the wheel of this inspirational little Toyota? If so, we encourage you to head to your local Toyota Centre for a test-drive and to learn more about the fantastic 0% finance and free insurance deals on offer.